It didn't take long for the High Woltage Caballers to bounce back from their shocking defeat in the Season 1 Finals. Not only did the team win the Pacific Rumble Qualifier tournament (setting up a possible championship rematch against Noble), but HWC star Adam "Wallhacks" Interrante is also spearheading BULBA's charge to first place in the newly-formed Clan League. Wargaming caught up with Wallhacks to get his thoughts on the upcoming Rumble, tier X league play, and what it's like switching gears to take on the Champions Division of Clan League. WG: HWC was the heavy favorite heading into the WGLNA Finals. What happened? Wallhacks: We thought we were our own favorites, too. (Laughs) We just played really bad, really bad. Was it a communications issue? Bad strats? The first map was Himmelsdorf, and we lost 4-0. We never lost 4-0 before, so right there, it was communication, and we got knocked down really bad. It was a combination of communication and bad play. 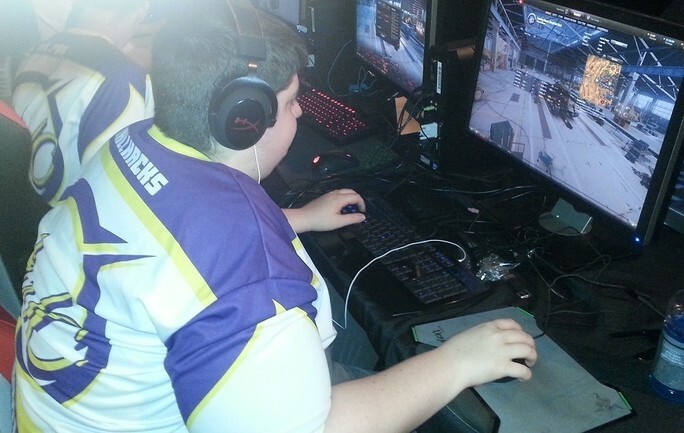 For four of us, it was our first LAN experience, so my settings weren't perfect. My settings weren't even something I was thinking about going in. I wasn't really nervous, but I'm sure other people were, and it showed in the way they were talking. You guys bounced back and took the second set, though. Yeah, Mines is our map. We overestimated Noble. Nothing against them, they deserved it, and they played better, but we prepared for a better team and we overestimated them. But if you prepare for a better team, how do you then lose to a lesser team? The way they played wasn't the way we were expecting. They played well, but it wasn't as fast as what we thought. All we practiced against were EU teams, and the way they play is 100 percent different. You guys won the Pacific Rumble Qualifier and are headed to Tokyo next week. Are you hoping to get a rematch with Noble while you're out there? That would be great. Hopefully everybody got the cobwebs off and hopefully the confidence issue isn't there where they think just because Noble beat us last time, they'll beat us again. We don't even need to think about that. If we play our game, if everybody plays to a fraction of how they play offline, then we should be good. Don't get me wrong, Noble played well. On Himmelsdorf, it was a lot of our problems. We almost won some of those Ruinberg fights, and winning on attack is very hard, and we almost won a couple of those. There were a lot of player mistakes there. Then on Lakeville, they actually destroyed us, so they deserved that. I was like, "Wow!" How have you been preparing for some of the Asian teams you will face at the Rumble? It's hard to watch their matches because you have to mute the stream. Some of their casters are annoying. (Laughs) We were pretty close with ARETE, who are now KongDoo. They lost their main player, and we practiced with them after that, and it seemed like they were having trouble, so I don't know what's going on with them. We've also scrimmed with Caren Tiger in the past, so we're ready. Do you think HWC has what it takes to be the first NA team to win a Rumble? I hope any NA team wins that. It would be amazing. I just wish I could stay in Japan longer. I really love everything samurai, and I'd love to be able to visit all of the old palaces around the country. The culture is amazing. You're also playing in the first season of the Clan League with BULBA. What made you want to join that league as well? Being in the Clan, there's a lot more people than just the 10 you have in WGLNA, so there's always people who want to try to do other stuff. Plus, we have a silly rivalry between us and OTTER. We go back and forth breaking each other's balls. We're just constantly at each other. It's fun, it's stupid, and sometimes it gets carried away. For fans of WGLNA, how is Clan League different? The Clans attract more people in the U.S. than the Wargaming League, but we're trying to fix that. More people know the Clan names than the team names because you see the Clan names every day in the pubs. You don't see team names. And you have some other Caballers on BULBA, right? Yeah, it's me, Ox, Angry, and HeavyTwenty. The rest of HWC is in OTTER, so it's funny how we're versus each other in Clan, but then we play together during WGLNA. I actually really like playing Clan League a lot. It's something different, and I like it better than just playing Clan Wars. Besides, if you win, you win a ridiculous amount of Gold for your Clan. WGLNA just announced Season 2 will be played using tier X tanks. Any early thoughts? I think it's a great thing. I think it will change the entire league completely. I wish we could play the current format longer because I thought this was the best one yet, but I think tier X will be better. Clan League is using the same type of attack/defense map, so you can kind of see what positions work, not necessarily what strategies work, since Clan is using more players. What tanks do you think are going to dominate the tier X league? I think the Waffle, E 100, and the E5 will dominate. I'm usually a heavy player who leads the push, because everybody else is afraid to get shot, so I'll probably be rolling in an IS-7 or something else heavy with some decent armor. WGLNA Season 2 is fast approaching. What can we look forward to from High Woltage Caballers? I want to say that we're going to be stronger than ever, but that loss to Noble really messed us up. We're really trying to just get past that at the moment. That's why it would be great to get a rematch in Japan. If we can just minimize our mistakes, I think we can beat them, then we can put that loss behind us. What was it like seeing your teammate, Dakillzor, bring home the MVP last season? What was up with Daki and the Finals? Every time he wore his pink hat, you guys lost. Yeah, I think the hat was broken. The crown was a little off, so we told him not to wear it, but he wore it anyway and we lost, so we were like, "All right, take it off." He needs to find a new gimmick. Whatever magic that hat had stopped working. Hopefully he has something else planned for Season 2. Check out Wallhacks and his Caballers in the Pacific Rumble, Friday, November 6, 19:00 PT on BattleViewer.